I discovered Pam Huston when I was just becoming a writing student. I was 18 and fresh to the craft. As first writing attempts go, I was relying heavily on first person narration. Like everyone else that sets out to write I found that my character’s voice got tangled in my own and my fiction quickly turned into a young woman’s reflections on being a young woman. I’m amazed at how my writing teachers and fellow class mates slugged through it all. I came across Pam Huston’s collection of stories “Cowboy’s are My Weakness,” just as I thought I was discovering my “voice”. The women in her stories were the women that I wanted to write. They were witty, tough, and cynical women that loved hard and lived fully. They fell in love with the wrong men and they weren’t going to apologize for their mistakes. At 18 I loved it. I still do. Their voices are still a part of my vocabulary. 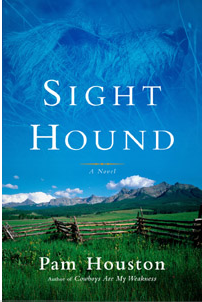 So I find myself disappointed to report that I was unimpressed with her novel “Sight Hound.” The story circles around the relationship between Rae, a slightly neurotic play write, and Dante, an enlightened Buddhist wolfhound. Rae is just the kind of woman Pam Huston writes so well. She is loves her dog and her ranch house in Colorado. She’s successful and lives comfortably with 2 homes. And, like many women in “Cowboys,” Rae is always falling for the wrong men. Dante is her constant companion, whose been put in her life to teach her to love. As Rae learns to fall in love Dante is slowly dieing from cancer…Opera eat your heart out. Dante and Rae tell their story along with 12 different first person narrators who have relationships with both Rae and Dante. The cast includes (but is not limited to) Rae’s boyfriend, her cat and her other dog, along with series friends and ex boyfriends. While Huston does a good job of juggling the stories from 12 different people, she fails to keep their voices separate. Everyone sounds like every body else and in the end the characters are left behind and we’ve only got Pam Huston’s voice mimicking all the characters. The voices begin to loose their authenticity, especially Dante who’s chapters are defined by quotes from Buddha. The Zen dogma is overplayed and the true moments of grace are skipped over. The story is set in Colorado and the time Huston spends setting up the country is time well spent. She knows how to create a sense of drama and scene. It’s to bad that she doesn’t spend more time exploring such a rich resource. What the novel lacks the short stories make up for in spades. Skip the novel and get down and dirty with her short stories.